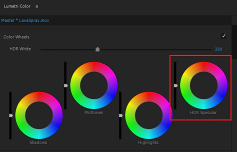 Setting up a color workspace using Adobe's Lumetri color grading control. With ATSC 3.0 poised to change the broadcast industry’s basic signal, we need to understand this signal is poised between HD and true 4K. The way the UHD (Ultra High Definition) evolution has rolled out, its specification is so broad there is something in it for everyone. That also means that anyone can cherry pick out of it what best suits their purposes. The IABM conducted a user survey at last year's NAB convention. Members of IABM account for more than 80% of the broadcast and entertainment technology market. One survey question asked whether the increased number of pixels of UHD is the attraction, rather than better pixel, which can be delivered by the HDR (High Dynamic Range) component? End users at NAB chose HD + enhancements over UHD as the preferable signal format going forward. Click to enlarge. Image: IABM. When it comes to pixels, improved quality wins out over quantity. Image IABM. Click to enlarge. When asked what enhancements "they are interested in or have launched,” a high percentage of respondents chose HDR (88%). This corresponds with the results shown above from end-users interested in HD/UHD+ enhancements. Wide Color Gamut (WCG) and HFR seem to be less popular with end-users, at 18% and 12% respectively. This perspective was echoed by Patrick Palmer, senior product manager for video editing at Adobe, to whom I turned for insights into the UHD signal space because Adobe’s product line covers a broad spectrum of post production technology. These results show that end-users are more interested in combining enhancements such as HDR and HFR with HD rather than with UHD. Also, they are less interested in investing in UHD only. This shows that ‘better pixels’ may be more important than ‘more pixels’ for them. But according to Adobe’s Palmer, the universal request he hears from creatives in the industry is for the RGB color space used for DCI (Digital Cinema Initiative) compliant packages, P3. And P3 covers just 45.5% of the CIE 1931 chart. You may not know it, but all current Apple devices, from the iMac to the iPhone display their color in P3 as do almost all other digital mobile displays. If Palmer can envision a conversion between broadcast and cinema on color gamut it gets all the more complicated when he dives into the HDR pool. Beyond that, one client wants their HDR timed to 600 nits of brightness, another demands 1,000, and the third requires 2,000. Not only would that be hard to create, what kind of a critical evaluation monitor would you use to evaluate it? And even if you had one, could you afford a second very expensive high tech monitor for your clients? 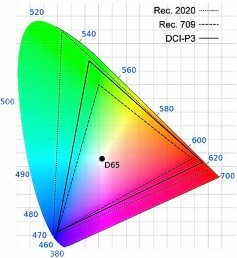 CIE 1931 Chromanicity diagram showing the color gamut of UHDTV (Rec. 2020), DCI (P3) and HDTV (Rec. 709). Click to enlarge. Palmer finds this all somewhat frustrating because it is getting in the way of what we all basically want to do, and that is telling stories. He would rather see the industry concentrate on sending out a better HD signal, one with perhaps less compression, than jump on the higher resolution bandwagon for delivery. He also reminds us of one key factor that all too often gets overlooked—that from a normal viewing distance in the average home theater room, most people’s eyes cannot tell the difference between a true UHD signal on so-called “4K” TVs and a properly up-rezzed HD signal on the same screen. Specular White control adjusts tone at given HDR white value. In example, if white point is set to 200, all values above 200 must change while adjusting HDR Specular control. Click to enlarge. And he can get a good laugh out of the reality that there is a whole generation that is growing up watching their digital content on small iPad and cell phone screens. For them, UHD is irrelevant. HLG is a royalty-free HDR technology that has been approved by the Association of Radio Industries and Businesses (ARIB). HLG is part of the International Telecommunication Union’s (ITU) Rec. 2100, is compatible with standard dynamic range (SDR) displays, defined in ATSC 3.0 and supported by HDMI 2.0b, HEVC (High Efficiency Video Coding), VP9 (video coding developed by Google), and H.264/MPEG-4 AVC. Editor's note: Don't miss the first article in Jay Ankeney's three-part series on UHD technology. Part one, UHD Post-Creating UHD, can be found at this link. Part three will be published on February 21st.